The suggested retail price for a small luggage box is $12.95. (CNN) -- Frustrated with the baggage fees airlines seem to be throwing at you left and right? 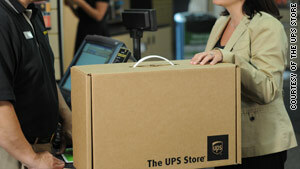 UPS has introduced a new product that reminds travelers of an alternative to lugging bags. Ship your luggage and have it waiting for you at your destination. UPS is selling new luggage boxes that allow travelers to skip the suitcase altogether. The luggage box is one of the three options The UPS Store has to offer travelers who want to avoid airline baggage hassles such as lost luggage and time-consuming security checks. Luggage can be shipped as is, placed in a traditional box or shipped sans suitcase in the new luggage box. Shipping does come at a price, and the new box is extra. A small, carry-on sized box runs $12.95. A larger box is $17.65. The cost of shipping is determined by weight, distance traveled and the service selected. The boxes are reusable and cut down on shipping charges by dropping the weight of a traditional suitcase. If a last-minute change of plan were to occur, the luggage boxes -- which meet airline standards -- can be taken aboard planes. The smaller box meets carry-on requirements, UPS said in a news release. UPS does not recommend this alternative to checking bags for international travel, because of duties and taxes associated with international shipments. Although shipping luggage via air is possible, the high cost is likely to trump convenience for most travelers. Shipping bags via UPS ground transportation is priced more competitively with airline baggage fees, although generally still more expensive. The drawback: Travelers have to plan ahead to get shipments to their destinations on time. The bonus: Unencumbered movement through security, onto the flight and out of the airport without a stop at the baggage carousel. U.S. airlines made $769 million in baggage fees from January to March this year, according to the Bureau of Transportation Statistics' 1st-Quarter 2010 Airline Financial Data. Delta alone collected $217.8 million in baggage fees this quarter. "Luggage shipping picked up when the airlines began increasing fees for checked bags and carry-ons," said John Minetola, a UPS Store franchisee in a statement. Shipped luggage can be tracked with UPS mobile apps for cell phones or travelers can receive e-mail shipment notifications.